Games can ensure a ninth birthday party is memorable and fun. Birthday games can be simple to organize and often inexpensive to set up. 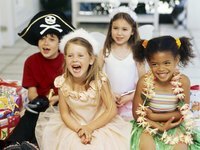 While some games may work better with single-gender groups, there are also plenty of options available for boy-girl parties. A birthday party scavenger hunt can keep 9-year-olds entertained for hours. Let neighbors have a copy of the list in advance and warn them to expect the kids on party day. Make a list of simple objects that can be found in most households like a blue ballpoint pen, a bar of soap or a small piece of wrapping paper. For a twist on the traditional scavenger hunt, use digital cameras or camera phones to take pictures of the objects. For a boy's birthday party, request that each guest brings a toy valued at $5 or less. The toys should be wrapped or concealed in a bag or a box. At the party, stage a kind of swap. Mark each toy with a number and put matching numbers in a hat. After all the boys choose and unwrap their gifts, they can swap. 9-year-old boys can also be entertained for hours by a water fight. You just need water balloons, squirt guns and plenty of space for running around. Set up a foil fashion contest to see which girl can make the most creative, wacky or best outfit from a roll of aluminum foil. Set a timer and give the girls a limited window of time to come up with their looks. You can provide other tools like paperclips, tape, rubber bands, twist ties, or string to help them make their outfits. After the timer beeps, set up a runway so each of the girls can show her creation to the rest of the guests. Allow the birthday celebrant to choose a favorite movie to watch with her friends. Afterwards, host a game of movie trivia about the movie you just watched together. The child with the most correct answers can win a prize. For example, after watching Grease, you could ask the kids questions like “What was the name of Kenickie’s car?” and “Where did Sandy move from?” Watch the movie before the party to come up with your own questions for the party. Award a prize related to a movie night, like a tin of caramel popcorn or a DVD.